Many types of insects and bugs invade Australian homes. Cockroaches are one of the most common and petulant. Some roaches thrive in certain conditions while others are drawn to other environments. They are one of the most common pests in people’s homes and they carry disease and bacteria, so they are even more of a worry if left untreated. Cockroaches have been busy on this planet for over 200 million years? They love to populate uncleaned areas, near food near bins and unsensitised environments and often carry disease and bacteria’s. Dropping food crumbs on your floor or leaving food out is the flag to invite cockroaches into your home, it’s no surprise when home owners start renovations and taking down walls or removing kitchen cupboards you may have hit the motherload of Germans. In my time as a pest control exterminator people have said “ Mate! all cockroaches look the same right?” Wrong!. 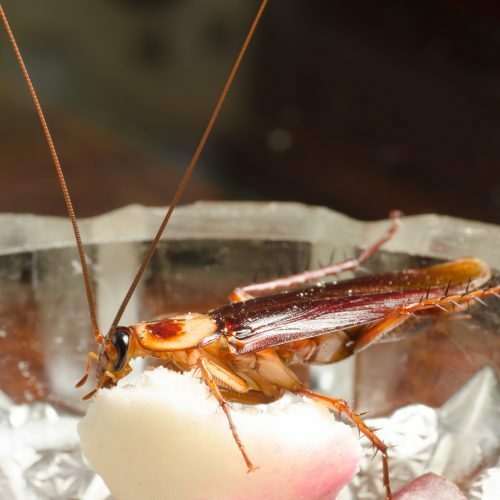 to the untrained eye, many clients have suffered from what I term “roachism” (racism towards roaches) When you look under the lenses at our ugly little friends we can see important differences between them. All roaches aren’t born equal, The American roach is distinctly different from the German roach. They may look similar, but they behave differently and search for different types of environments. They reckon they can survive a nuclear explosion and live for days with their head missing? I bet they can’t survive being hit with a shoe? Due to their open circulatory system, and the fact that they breathe through little holes in each of their body segments, the only reason it dies because without its mouth, it can’t drink and dies of thirst. One of the most telling signs between the American and German is its noticeably larger size and dark reddish/brown colour. If you’ve tried to swat a roach only to witness it suddenly fliy away, its most likely an American and if you’ve left food crumbs on your kitchen floor the American is likely to welcome itself as a guest into your cosy little home. Germans on the other hand or “Germinators” are much smaller and have light brown stripes on its back and are commonly found in walls and dark crevasse. But Germans outnumber Americans by a large percentage they lay multiple eggs in a short period of time and a female can produce up to 150 eggs per year. German females can lay up to 30,000 eggs in one year. While both types of roaches prefer to live in hot and humid environments Germans prefer much more heated and humid environments such as plumbing areas, under cabinets, under refrigerators etc. Americans consume leaves, wood, fungus, algae and human food scraps while Germans will eat pretty much anything they come across including such as toothpaste, paper, leather and food. If you see droppings you should know how to tell the difference between the trail of faeces. The evidence is in the Poo. An American will leave blunt faecal matter with ridges. Our little German friends leave black pepper like faeces in their trail. Americans live longer between 1-2 years while Germans have a shorter life span between six months to a year. Did You Know that cockroaches are edible? Not that I would recommend it but then again I wouldn’t recommend welcoming these unwanted pests into your lovely home either.. if they’ve been fed on fresh fruits and vegetables they supposedly taste like greasy chicken?